President-Elect Donald Trump denies the veracity of climate change, he refutes the legitimacy of fact based media and now he is questioning US intelligence on Russian interference. This makes Trump the perfect stooge for Vladimir Putin's sophisticated plot to destabilize his enemies. Trump maintains his ignorance despite being given numerous briefings, including one from the heads of US intelligence services on Friday, January 6th. Trump is easily manipulated with platitudes. He admires the Russian dictator and he has repeatedly called him "smart". Unlike the buffoon that will soon lead America, The Russian strongman is indeed smart. Think of what he has managed to do. He has driven a wedge between the President-Elect and the intelligence community, he has encouraged a rift between the US and its allies and he has divided the American people. This bloodless coup also sets the stage for the removal of sanctions against Russia and drilling for oil in the Russian Arctic. Trump does not understand the basic physics behind climate change let alone the complexities and nuances of spycraft. Putin is a master, he is the former head of secret police agency FSB (Federal Security Service of the Russian Federation) that replaced the KGB along with the espionage agency SVR (Foreign Intelligence Service). To make matters worse, in a move reminiscent of Stalin, Putin is consolidating his intelligence services, while Trump is denying the veracity of US intelligence. In a tweet this morning Trump called those who are leery of Russia "stupid". The seriousness of the situation cannot be overstated. As explained by Steven Harper in Bill Moyers.com "Trump’s presidency is an inflection point in the great American experiment of self-government." U.S. intelligence officials now believe with "a high level of confidence" that Russian President Vladimir Putin became personally involved in the covert Russian campaign to interfere in the U.S. presidential election, senior U.S. intelligence officials told NBC News...Ultimately, the CIA has assessed, the Russian government wanted to elect Donald Trump. After initial reports suggested that there was no consensus on Russian hacking, the heads of the US intelligence community came together to brief Trump and dispel any doubt about the veracity of the information tying Putin to electoral interference. The Office of the Director of National Intelligence released a damning public report conclusively saying that there was clear and incontrovertible evidence that Putin was involved in hacking operations in the US. It leaves little room for doubt the Putin was actively interfering with America's Democratic process in order to destabilize the country and help elect a stooge. Many Republicans appear to be trying to protect Trump from a full enquiry and possible impeachment. Among them are Senate Majority Leader Mitch McConnell (R-KY) and House Rep. Paul Ryan (R-WI). However, Other Republicans like Senators John McCain and Lyndsey Graholm consider this to be a serious issue that warrants further investigation. Last week members of congress delved into Russian influence. McCain led this investigation and he said Russia's meddling in the 2016 presidential election amounted to an "act of war." Fake news is central to Russia's misinformation campaign. Putin is the world's largest purveyor of fake news. Russian manipulation extends far beyond hacking. Putin is using digital media undermine national narratives and foster division. He is building fake news outlets and amplifying fake news to sew doubt and foster confusion. As reported by Jill Dougherty in a CNN article, two studies indicate that Russia was involved in both the creation and the spread of fake news. According to Clint Watts, senior fellow at the Center for Cyber and Homeland Security at George Washington University, the "Russian propaganda apparatus" was very active during the presidential election of 2016. 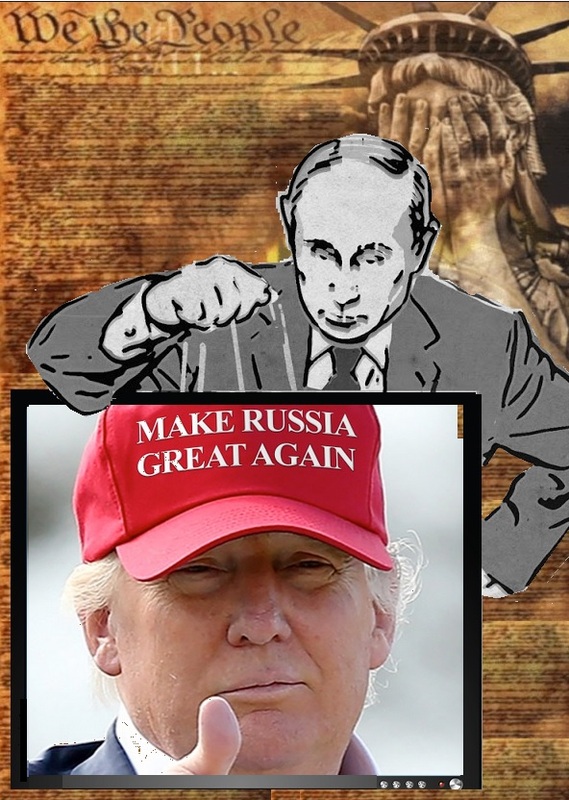 The goals of the Russian campaign were the same as Trump's, "erode trust in mainstream media, public figures, government institutions..."
The most damaging dimension of Putin's manipulation is the fact that he has succeeded in undermining the US democracy by eroding the public's trust in free and fair elections. The Trump administration is chalked full of people who create and disseminate fake news. Members of the Trump administration who disseminate lies masquerading as truth. This includes Trump himself, who has emerged as the godfather of fake news. The reason that Trump hates real news is because truthful reporting is disparaging to him and he administration. Trump's chief advisor Steve Bannon of Breitbart infamy is one of America's most prolific outlets for politically motivated deceit. Trump’s pick for national security adviser, Michael Flynn subscribes to a number of conspiracy theories and regularly spreads fake news. His son lost his job on the transition team for his outlandish tweet accusing Hillary Clinton of running a pedophilia ring out of a pizza parlor. Flynn tweeted, "Until #Pizzagate proven to be false, it'll remain a story. The left seems to forget #PodestaEmails and the many "coincidences" tied to it." Texas Agriculture Commissioner Sid Miller, who may end up being a member of the Trump administration, has a penchant for spreading fake news from far right websites. When he was asked to explain his remarks he told Austin-based KUT News, "I’m not a news organization. Y’all are holding me to the same standards as you would a news organization, and you know it’s just Facebook". Ben Carson, Trump's pick to lead the Department of Housing and Urban Development, Rudy Giuliani, and Laura Ingraham, who may end up being the White House press secretary, she is also the owner of LifeZette news. Rex Tillerson is probably the most adept Trump administration appointee when it comes to manipulating the public. He is the CEO of Exxon which is arguably the world's most corrupt corporation. These purveyors of fake news are the ones who will have their hands on the levers of power for the next four years. Russians are laughing at the United States. They know that Putin is playing Trump like a fiddle and treating the president-elect like a fool. Russia expert Nina Khrushcheva said Trump is playing "right into Putin’s hands." "I was just in Moscow and the Russians are saying ‘Look at those fools, look at their their democracy.’ Absolutely," she said. "How could America lecture us on any development, institutions, human rights, democracy, rhetoric when they just elected Donald Trump. He’s such a fool. He’s such a bully. That’s what America deserves and we’re going to take advantage of it. And that’s how Russians feel about it, and now it’s taking shape with letters from Vladimir Putin to Donald Trump with their exchange on potential nuclear armament and whatnot." On the same MSNBC panel intelligence analyst Malcolm Nance said Trump will hinder an investigation into Russian hacking and he laughed at how easily Trump can be manipulated. "I don’t think there will be any accountability with the regards of the Russian hacking against the DNC or even violating the entirety of the U.S. electoral process. He has benefited from that," Nance explaiend. "He’s going to shut down any investigation if it implicates him or his campaign...We are being played as fools by a spymaster-in-chief, a former KGB officer, Director of Russian Intelligence. He’s laughing at us in his letters which stroke Donald Trump. ‘His excellency!’ We haven’t had a letter like that in the United States since King George III. As long as Trump is manipulated, Russia and China will take our market share from the international markets out there, and the United States will be relegated to a third class country." As explained in a December 15th New York Times editorial by Doug Mills the facts implicating Russia are convincing to all but Trump. "There shouldn’t be any doubt in anybody’s mind," Adm. Michael Rogers, the director of the National Security Agency and commander of United States Cyber Command, said recently. "This was not something that was done casually, this was not something that was done by chance, this was not a target that was selected purely arbitrarily," he said. "This was a conscious effort by a nation-state to attempt to achieve a specific effect." Trump's response was to dismiss the CIA's findings as "ridiculous". He handed Putin a gift when he said, American security officials are, "fighting among themselves." The only fighting going on was the effort to penetrate Dondald's remarkably thick skull. Even after he recieved the briefing from the heads of the four major US intelligence services he still persisted in maintaining the Putin's interferrence did not alter the outcome of this election. Trump has tried to distance himself from Russian interference but according Russian diplomats there was direct contact between the Trump campaign and Russia. As reported by Reuters, Sergei Ryabkov, Russia’s deputy foreign minister said, "there were contacts" between Moscow and Mr. Trump’s campaign. "I cannot say that all of them, but quite a few have been staying in touch with Russian representatives." Trump's campaign manager Paul Manafort, was forced to resign after reports described his political ties to Russia. Lt. Gen. Michael Flynn, Mr. Trump’s national security adviser, sat with Mr. Putin at a gala for Russian state television and Trump's pick for Secretary of State, Rex Tillerson has a very close personal relationship to Putin. An investigative piece by the New York Times reports that Mr. Trump’s own business ties to Moscow date back to the late 1980s. Donald Trump Jr. told a real estate gathering in 2008 that "Russians make up a pretty disproportionate cross-section of a lot of our assets," adding "we see a lot of money pouring in from Russia." This may be the real reason why Trump has not released his tax returns. "There could be no more 'useful idiot,' to use Lenin’s term of art, than an American president who doesn’t know he’s being played by a wily foreign power." "A Financial Times investigation has found evidence that one Trump venture has multiple ties to an alleged international money-laundering network. Title deeds, bank records and correspondence show that a Kazakh family accused of laundering hundreds of millions of stolen dollars bought luxury apartments in a Manhattan tower part-owned by Mr Trump and embarked on major business ventures with one of the tycoon’s partners." On Friday, January 6th Rachel Maddow presented the intelligence report proving that Russia interfered with the US election in 2016. She shows how Trump continues to lie to the American people. After the intelligence briefing, Trump released a statement that said "there was absolutely no effect on the outcome of the election." Maddow explains that this is a bold-faced lie. Trump "blatently, overty, bluntly lied." Maddow said. As explained by the MSNBC host, "our new president will flat out lie to us." In the face of such unprecedented deception and malfeasance good people are looking for ways of protecting democracy from the darkness that is about to descend. In the post-factual world of Trump and Putin, those who subscribe to science and reason are challenged to finds ways to make facts matter. "For those resisting Trump, the challenge is enormous. Complementing his vile messages was the three-headed hydra of disorientation, distraction and dissembling — hallmarks of his candidacy. The election was never about competing substantive policies, but its outcome provided the positive reinforcement necessary for Trump and his advisers to continue pursuit of their strategy toward ends that only he and they know."